Marriage generally is a complex process. Indian marriages are observed for their vibrancy in clothing, variety in food and high cost. It involves a lot of customs and rituals which lasts for more than 2 days and costs up to 8-10 lakhs for an ordinary marriage. It becomes impossible for a common man to meet the high standards set up by the notions of what makes up a marriage by the society. "Simplicity is the ultimate sophistication", a typical marriage of Vaniya/Ganiga's at Perne in the presence of goddess Bhagavathi is a true celebration of simplicity and equality. Marked by simplicity in clothing, food and simple rituals, this marriage is economically and socially well respected. Marriages are held twice a year, during "Pooram" and "Udayastamanam" festival. The rules set by the community requires couples to enter into wedlock only at a temple. They come from Kasaragod, Dakshina Kannada and parts of Kodagu. Nearly 100 couples get married every year. The process of marriage takes a simple route. Initially uncles of the bride and the bridegroom come together and share auspicious words along with the Acchamar and Karnavamar who will be seated alongside the Kalyana Mantapam. Here they register the names of couples by paying a nominal fee (Thiriyammande Panam) prescribed by the temple. After this, the mother and three or four women close relatives of the bridegroom present a sari, blouse and a bunch of jasmine flower to the bride. Bride's mother receives them. This is custom known as "Poduvakodukkal". The bride should wear this sari for the wedding. The brother-in-law of the bridegroom guides him to the Achanmar with a gold chain. An Acchan ties this gold chain to the bridegroom and blesses him. The significance of this ritual is essentially permitting the boy to marry the girl who is morally under his custody. Main Acchan is the true representation of Tamburati. After that, the bridegroom is taken to a barber for a shave and later he takes a bath. Bridegroom will be dressed traditionally. In the mantapam, the seats are arranged for at least fifteen couples to sit together at a time.The Kalyanam are performed batch wise. A Mangalavathi women from the Pandarapura will hold a hanging lamp in her right hand and a harivana (brass plate) full of rice in the left hand, stands first in the row followed by the couples. Each bridegroom's brother-in-law holds the left hand of the groom and takes him to the procession. The bride stands behind the groom and holds the end of the grooms shawl and walks in the procession. They take three rounds (Pandal Cholunnuded) before they are asked to be seated. Then couples exchange mala. Interestingly there is no practice of tieing Managalasutra. Then, acchanmar and family members bless them by sprinkling rice. Finally, couples will be taken to Pandarapura in the same order of their arrival. Thus, the simple and fulfilling marriage comes to an end and people head back to their homes with the blessing of Muchilotamma and happy hearts to see the union of many hearts. The hand that rocks the cradle, the procreator, the mother of tomorrow; a woman shapes the destiny of civilization. In Perne, each girl child is valued and respected. 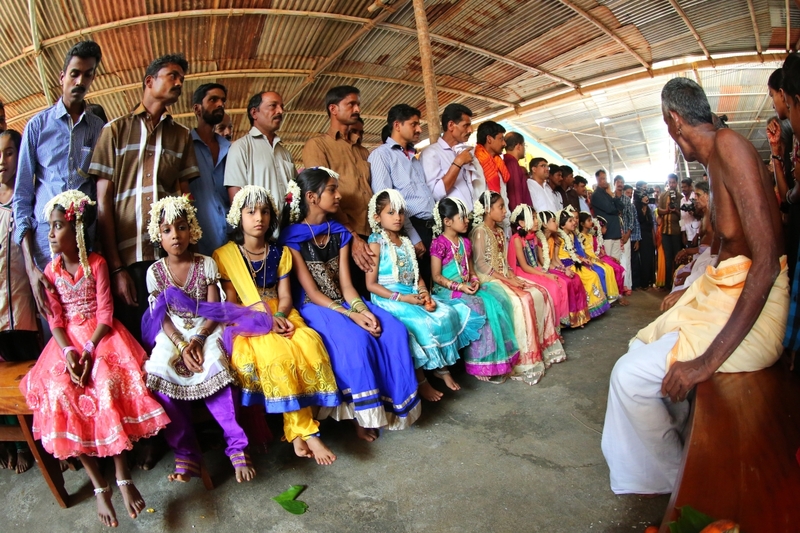 The practise of 'Pandal mankalam' takes place before community marriage. This has to take place before the girl reaches puberty. After this marraige, girl gets the status of women in the community. Pandal Mangalam should not be arrrnaged at home,its strictly done at temple where the pandal is arranged. In "Pandal", theAcchanmar and Karnavanmar sit according to their rank. The mothers of the girls or mother-in-laws bring their girl,well dressed in front of Acchanmar. The mother brings a gold chain and a pookula (a bunch of arecanut flower). Komara of Bhagavathi Devi, ties the gold chain to the girls neck and puts the pookula on her neck and blesses her. The gold chain is equal to the Mangalasutra, tieing that means she is dedicated to Tamburati and she will be protected by the community. Later when this girl gets married there is no practice of tieing Mangalasutra in Kalyana Mantapam.